And here I am, moments before shutting off that particular computer at Funcom for the final time. 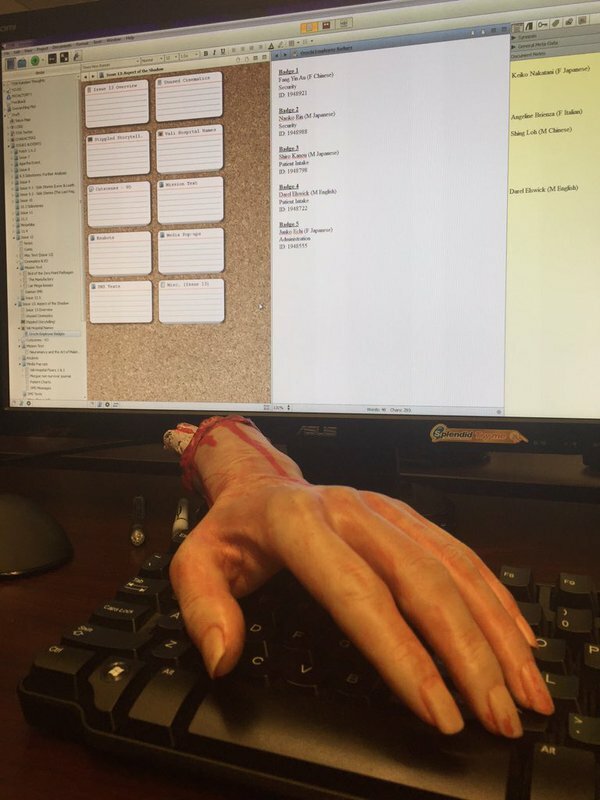 The Severed Hand — my trusty companion of four offices, three countries, two continents, and nearly seven years of video game writing — and I are readying for new adventures. Quite a day. I wrote a last bit of lore. We did a farewell Twitch stream. We had a little office shindig. Wow. So much to unpack. And I will in the coming days. But right now I’m going to soak it in. And there will be more news on just what I’m doing after all this. Much to tell. It’ll be posted here. Or keep an eye on my Twitter. Or…if you’d like some other conveyance of such news, leave a comment below and I’ll see what I might get going. Some gourds got more reason to grin than others. I’m a portrait! Look, look! The wonderfully phantasmagoric-minded Mel Addams made this for me. You can read their story why here. I’ll break the image down, because I want to illustrate just how much thought and effort went into this. 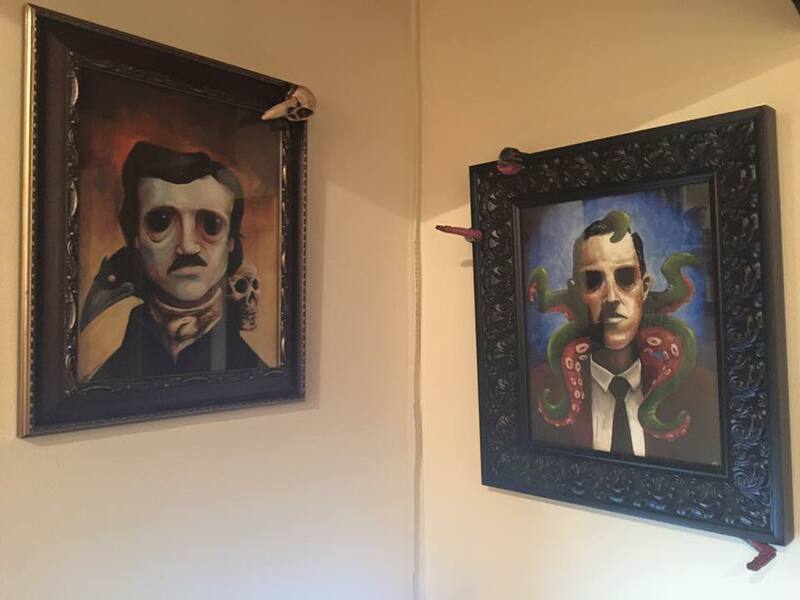 Mel saw that I had some lovely paintings of both Poe and Lovecraft on my wall, by Michael Bielaczyc. I once talked about the notion of Impostor Syndrome, the insidious doubt that you don’t belong or that some success was not really earned, and how that can pop into anyone’s head, from beginning to novice to the most successful. Mel, in their glorious and kind wisdom, thought a good safeguard would be for me to look up and see my face with a couple of my heroes. They put my face to the same stylized tilt as the Bielaczyc paintings. And they pieced me together from bits of things I’ve provided online over the years. 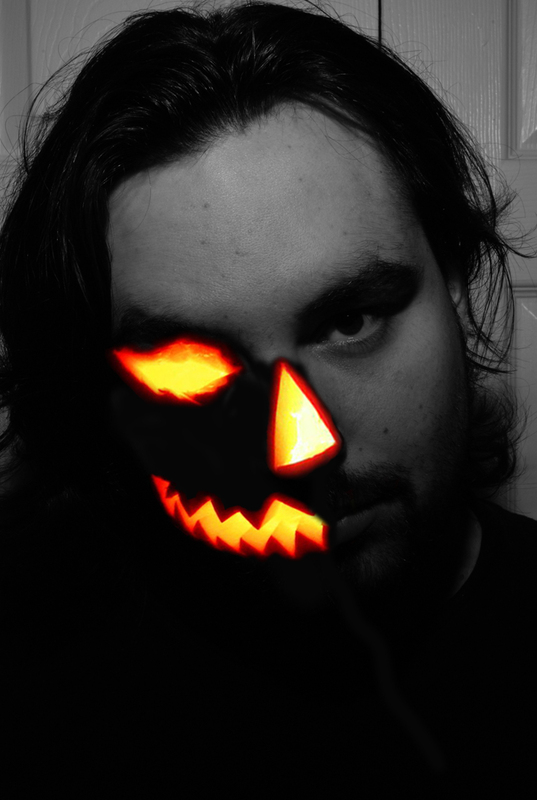 Years ago, I played around with photo shop to make this image of me. 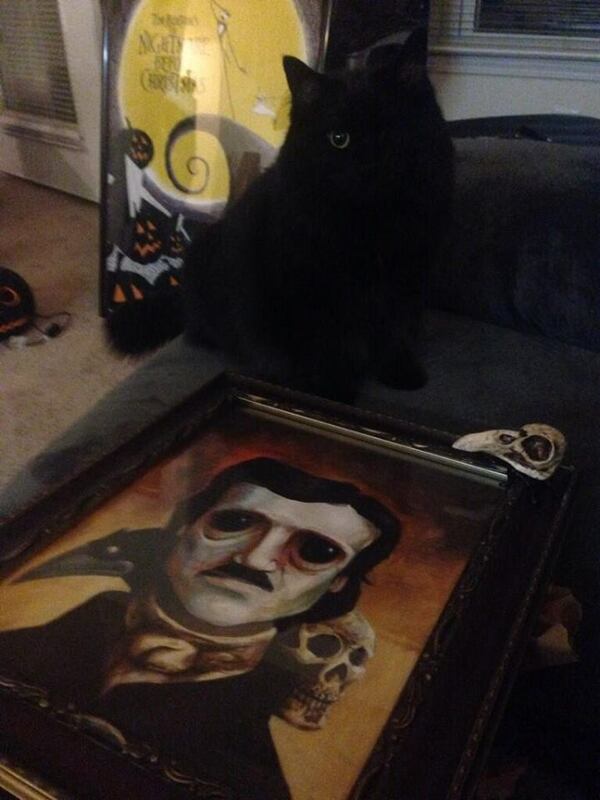 The one-eyed cat on the left, in the portrait, is my actual one-eyed cat, Raven. I adopted her in Montreal and she has been my home scrivnomancy familiar ever since. The served hand on the right, is my workplace familiar. I picked it up one Halloween, when I lived in Oslo. It’s been my office mascot ever since (in three countries). And was once a regular character feature on my twitter. And finally the top hat. 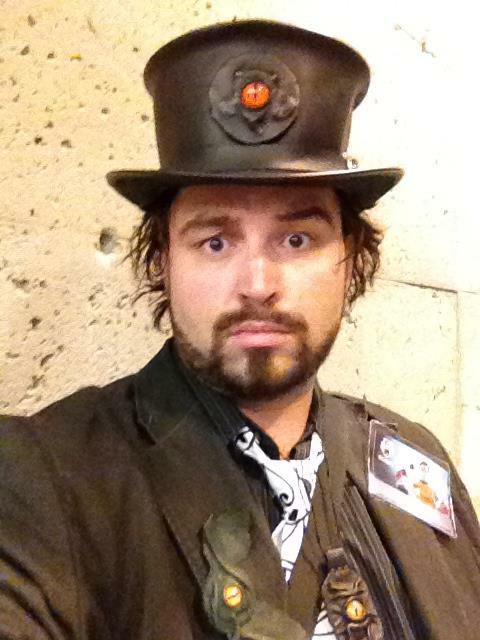 It’s actually my leather top hat, purchased from a vendor, many GenCons ago. The eyeball patch I got from Grichels. The hat has taken on a life of its own. Players and readers have gotten to know me by the image. 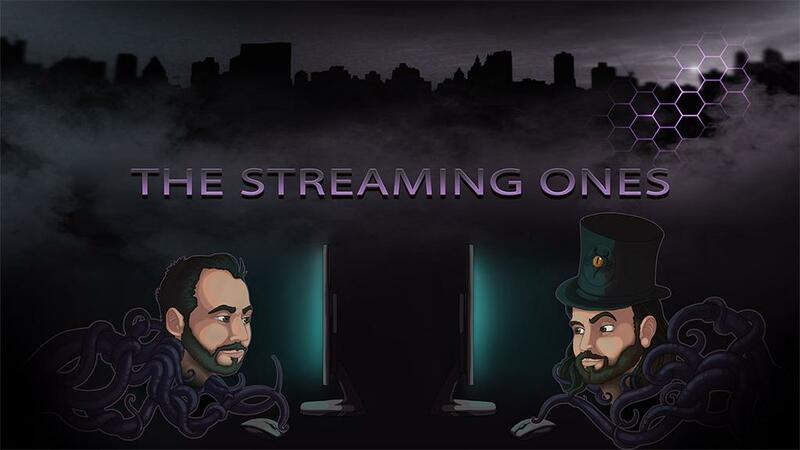 It’s featured in the live twitch dev-stream I do for The Secret World, called The Streaming Ones. The hat has even taken on surreal digital life within The Secret World game itself. Behold, Nyarlatophat! Also featured are a coat and vest of mine. And there you have it. The gift Mel gave me, besides their amazing talent, was an image that I unknowingly got to collaborate on making (by taking pieces of me). That’s a swell gift to someone who likes composing visual things (but with no real technical skill for it). It means the fiddling I did with photoshop or the eyeball I had attached to a hat, and the paraphernalia I surround myself in, all contribute to a sweet image. THANKS, MEL! If you happen to want a print of the portrait, you can contact Mel Addams to order.